Surprisingly, this dish was much easier to prepare than I had anticipated. I used the Le Creuset recipe, but adapted it to use white pearl onions instead of shallots (more visually pleasing). 1. Heat the oil in the pot over medium heat. Cook the bacon and onion until both are softened. Remove and drain well. 3. Preheat the oven to 275°F. Tie all the herbs into a bundle with fine string and add this to the pot with the garlic, tomato purée, lemon juice, sugar and red wine. Cover with the lid and cook in the oven for 2 to 2½ hours until the chicken is very tender. 4. About 30 minutes before the chicken finishes cooking, melt the butter and oil in a large frying pan over a medium heat. Add the pearl white onions and sautee for 10 to 15 minutes until they are soft; transfer to a plate. Add the mushrooms to the pan and toss so they are just cooked and coloured. 5. Blend the butter and flour together in a small bowl. 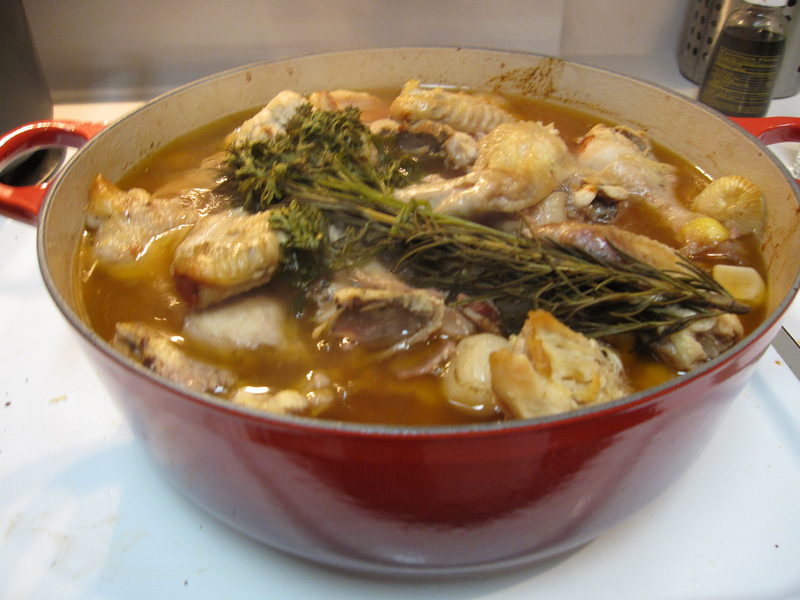 Remove a few pieces of the cooked chicken to make room to stir in the beurre manié. Add this in small amounts, stirring after each addition so that the sauce remains smooth. 6. When all the beurre manié has been incorporated, return the chicken together with the shallots and mushrooms. Simmer for 2 to 3 minutes. Serve from the pot. Overall verdict: The chicken was fall-off-the-bone tender, but a few pieces of the white meat were still dry (who likes white meat anyways?). The sauce was delicious, but definitely needed more thickening, as it was more of a broth than sauce. While my friends gave me much praise and many went back for seconds and thirds, this meal was not exactly up to my standards. Next time, to highlight the flavours of the sauce, I plan to remove all the chicken from the pot, simmer the remaining broth on the stovetop and add as much of a flour & water mixture it takes to reach a thicker consistency. Also, since only one of my friends likes white meat, I’ll use mainly chicken thighs and legs next time.